A four-day trip to Yosemite Valley in the latter half of spring break (2010) lend credibility to why Yosemite stands tall as the best National Park in the USA. 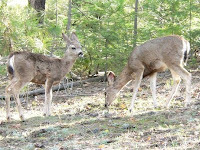 The park area consists of over three million acres of the Sierra Nevada. Within the Park, accommodations are limited – Park Service has outsourced the management of accommodations to the Delaware North Companies (DNC). Rooms with bare bones necessities (heater, hot water, and decent bed) were very expensive and started at around $150 (including taxes) during peak season. For that one gets a heated tent (wooden frame, propane heater, common bath, no room service but with towel service) at Curry Village. We went for a regular room with heating and private bath at Yosemite Lodge for around $230 including all taxes. Rooms can be reserved up to a year in advance and are quickly snapped up. 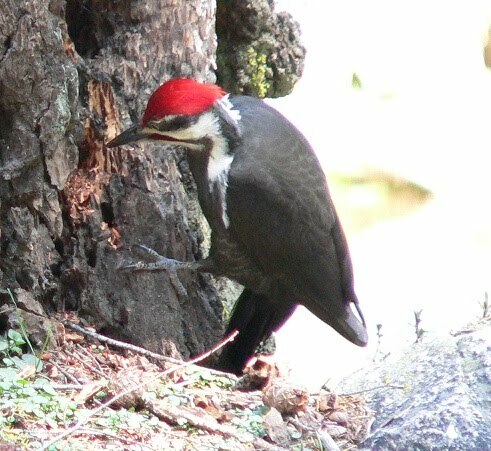 The historic world renowned Ahwahnee is the premium facility in the valley with rooms starting at well over $500. Even though we consider the rates outrageous, staying inside the park is still the best option. The outskirts are not exactly cheap (El Portal on Hwy 140 and Fish Camp on Hwy 41) and comes with commute while further out is economical (Oakhurst or Midpines) but prohibitive commute wise. 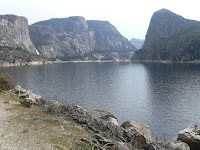 The approach roads to Yosemite Valley from the East Bay are 120, 140, and 41. 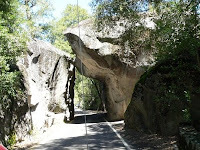 We started early and took the detour for Hwy 41 from Hwy 140 and took the tunnel entry into Yosemite Valley. 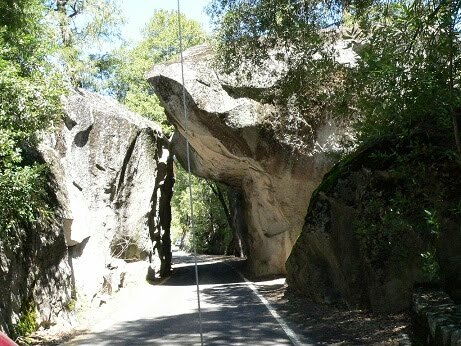 A good vista point before entering Yosemite Valley is immediately after Yosemite View Lodge on Hwy 140 at El Portal - the water, valley fauna and flora, and the granite rocks combine in harmony. 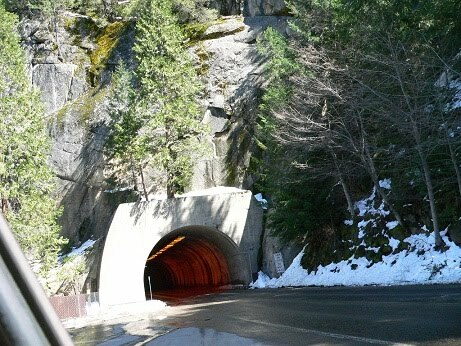 Parking is available on both sides of the road at the Tunnel entrance. 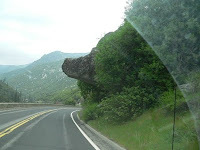 We made an in and out and in again through the tunnel to experience the view of the valley both ways – the view of the valley on exiting the tunnel is just outstanding. 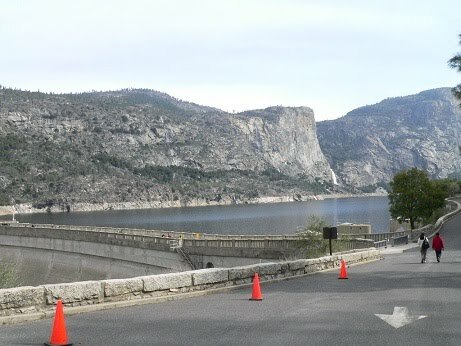 The parking lot on the right has the trail entrance for Inspiration Point (1.2 miles), Dewey Point (5.1 miles), and Glacier Point (13 miles). The trail starts out steep and we ventured a little bit and predictably the view gets better with elevation. 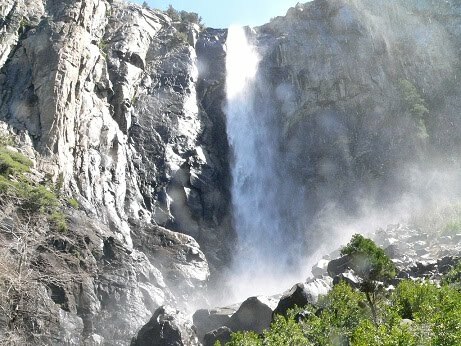 Bridalveil Falls is the first not to miss vista stop on the valley floor. The parking lot is petite, given the popularity of the falls. This half mile round-trip paved hiking trail to the base of the falls is of medium grade and is classified as an easy trek. 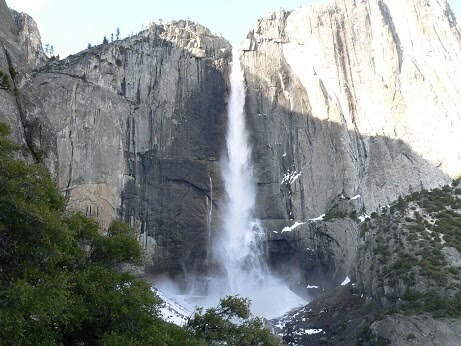 The falls have year-round water flow. Further down, meadows flank both sides of the road with panoramic views of El Capitan, a huge sheer face granite monolith that stands close to 4000 feet from the base to the summit, the largest in the world. Wooden boardwalks are built over the meadows in several areas in the valley as a protection measure. 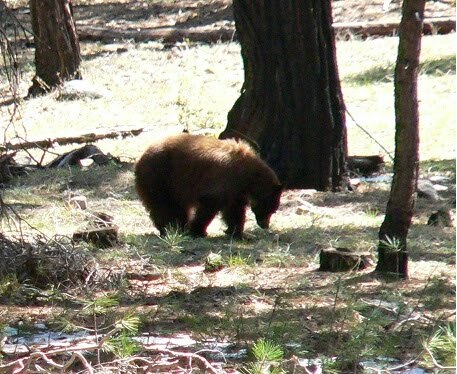 Bear sightings are possible as it is around this time they come out of hibernation. We were lucky to see one at a comfortable viewing distance. 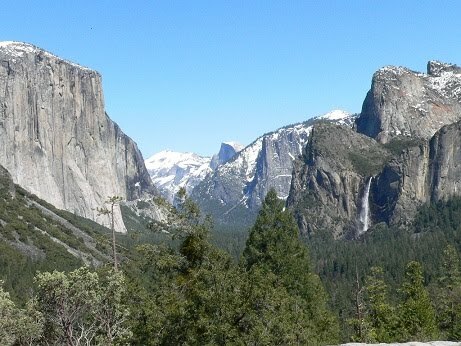 For first time visitors, identifying the granite monoliths El Capitan, Three Brothers, Sentinel Dome, etc. might be confusing but once identified the giants become friendly. 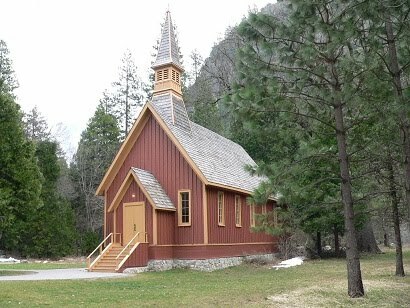 The Valley Loop Road turns around after the historic and distinctive Yosemite Chapel on the right. 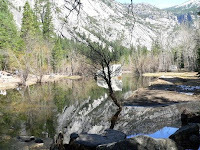 A left turn takes you over the Merced River and immediately to the right there is a parking lot. 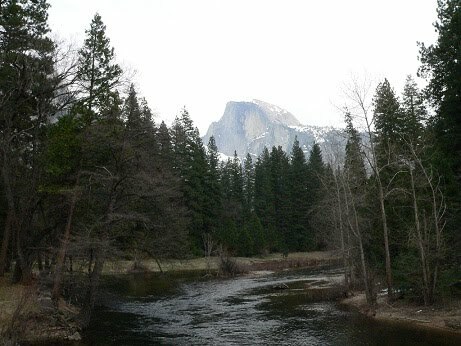 Walk back to the bridge to take in one of the best views of the Half Dome. Continuing on the Upper Loop Road takes you to the Valley Visitor Center and also accommodations at the Yosemite Lodge and the Ahwahnee. For Curry Village, it is back over the bridge and to the left. We arrived at Yosemite Lodge around 3 PM and tried our luck although check-in is after 5 PM. They said they could provide a room of their choice if we wanted to check-in early . We availed of that option but the room was not that great a location – corner room at ground level facing the main parking lot. As we were mostly outdoors, the room worked OK - but we recommend opting for rooms on the other side of the road – for those appear nicer and more private. 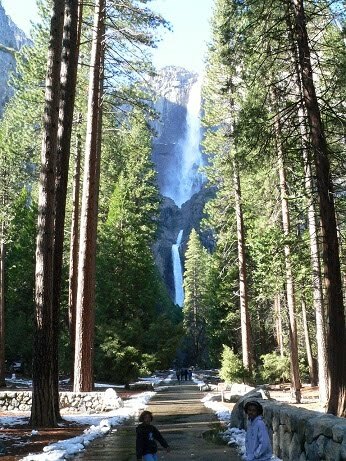 The best thing about Yosemite Lodge is its location right at the foot of the Yosemite Falls – a short walk gets you to the trail-head. The convenience of a cafeteria, gift shops, theater, bike rentals, and bus stops is also great. However the room itself is in dire need of an update. From the Lower Yosemite Fall trail-head, it is one-mile round trip to the lower Yosemite Falls, and the hike is classified as Easy with low gradation. The views are outstanding and perfect for those traveling with toddlers and/or seniors, for the entire stretch of this trail is more of a stroll than a real trek. 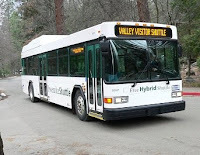 Yosemite Shuttle is an excellent alternative for transportation within the valley. S huttle Stops are numbered from one to twenty, with "one" starting at the Day Use Parking Area. It runs a loop and the only confusing part is figuring out how to go back a few stops – alight at those stops where the shuttle stops in the other direction. 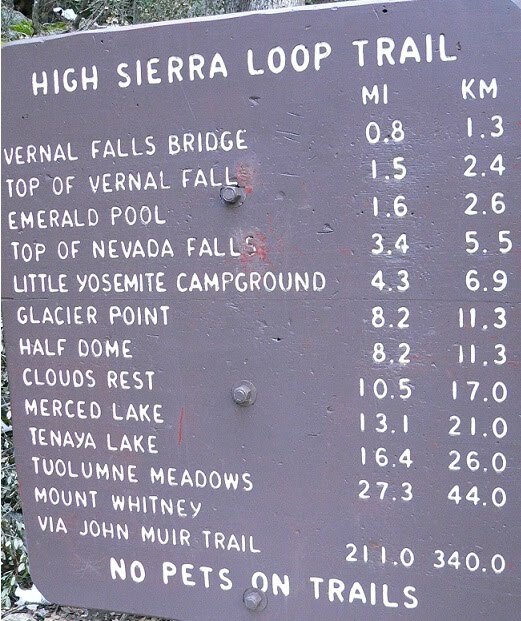 We alighted at Happy Isles (Shuttle Stop #16), the trail-head for several hikes including the Vernal Falls (1.4 miles round-trip to the foot of the bridge with a view, 3 miles round-trip to the top), Nevada Falls (7 miles round-trip), and the Half Dome (17 mile round-trip). We did a couple of short hikes in the morning and a longer hike in the afternoon on our first full day in the valley. 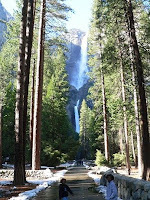 The plan was to hike to the top of the Vernal Falls and decide on the rest of the hikes based on how the kids fare. Unfortunately, the last 0.3 miles was blocked off due to a landslide. Next we headed to Mirror Lake (Shuttle Stop #17). The hike to Mirror Lake is pretty easy – even for those with very young kids. Parts of this seasonal lake were dry and accessible making for great picnic locations. These two treks together took up the bulk of our morning. In the afternoon, walked around to Camp 4, the trail-head to Upper Yosemite Fall (Top – 7.2 mile round-trip, Columbia rock – 2 mile round-trip). The hike to the top of the fall is expected to take between 6 to 8 hours and our plan was to hike as much as we can beyond Columbia rock. This was the most strenuous one we attempted but very rewarding indeed. After around the halfway point (around 2 hours) with daylight disappearing fast and the trail becoming more snowed, we called it a day. On our third day at Yosemite Valley, we drove up to the Hetch Hetchy Reservoir via Big Oak Flat Road (park pass required at the entrance). En route, we stopped by the Merced Grove Trail-head, one of three places from where it is possible to hike to a redwood grove. The entire trail (1 mile down) was covered in snow but there were a few attempting the trek anyway. 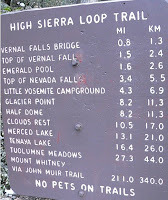 The hike to Wapama Falls is an easy trek in spite of it being fairly long (5 miles round-trip – 3 to 4 hours). There were plenty of children on the trail and the grade is low to moderate. 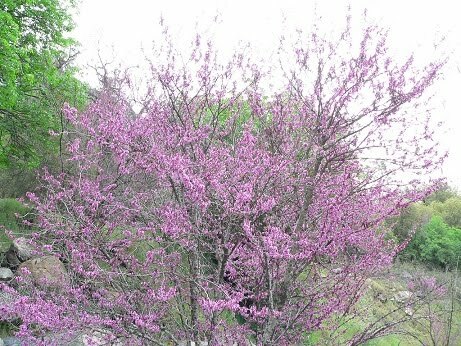 Several picnic spots exist on this trail. We spent the morning of the final day checking out the visitor center and the surrounding places accessible by foot. All in all, we trekked well over twenty miles in our four days there and left the valley content and relaxed beyond words. 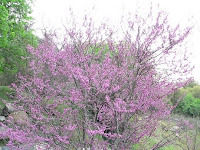 Nature has a way to soothe like no other. Great post! 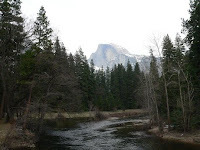 Check out our post on Yosemite Lodge @ Yosemite National Park as well!